Volkswagen (German pronunciation: [ˈfɔlksˌvaːɡŋ̍] - listen (help·info)), shortened to VW, is a German automaker founded on May 28, 1937 by the German Labour Front and headquartered in Wolfsburg. It is the flagship marque of the Volkswagen Group and is the largest automaker worldwide. Volkswagen was originally established in 1937 by the German Labour Front (Deutsche Arbeitsfront). In the early 1930s, the German auto industry was still largely composed of luxury models, and the average German could rarely afford anything more than a motorcycle. As a result, only one German out of 50 owned a car. Seeking a potential new market, some car makers began independent "people's car" projects – the Mercedes 170H, Adler AutoBahn, Steyr 55, and Hanomag 1.3L, among others. The trend was not new, as Béla Barényi is credited with having conceived the basic design in the mid-1920s. Josef Ganz developed the Standard Superior (going as far as advertising it as the "German Volkswagen"). In Germany, the company Hanomag mass-produced the 2/10 PS "Komissbrot", a small, cheap rear engined car, from 1925 to 1928. Also, in Czechoslovakia, the Hans Ledwinka's penned Tatra T77, a very popular car amongst the German elite, was becoming smaller and more affordable at each revision. Ferdinand Porsche, a well-known designer for high-end vehicles and race cars, had been trying for years to get a manufacturer interested in a small car suitable for a family. He felt the small cars at the time were just stripped down big cars. Instead he built a car he called the "Volksauto" from the ground up in 1933, using many of the ideas floating around at the time and several of his own, putting together a car with an air-cooled rear engine, torsion bar suspension, and a "beetle" shape, the front hood rounded for better aerodynamics (necessary as it had a small engine). In 1934, with many of the above projects still in development or early stages of production, Adolf Hitler became involved, ordering the production of a basic vehicle capable of transporting two adults and three children at 100 km/h (62 mph). He wanted his German citizens to have the same access to a car as the Americans. The "People's Car" would be available to citizens of the Third Reich through a savings plan at 990 Reichsmark ($396 in 1930s U.S. dollars)—about the price of a small motorcycle (the average income being around 32 RM a week). Prototypes of the car called the "KdF-Wagen" (German: Kraft durch Freude – "Strength through Joy"), appeared from 1938 onwards (the first cars had been produced in Stuttgart). The car already had its distinctive round shape and air-cooled, flat-four, rear-mounted engine. The VW car was just one of many KdF programs, which included things such as tours and outings. The prefix Volks— ("People's") was not just applied to cars, but also to other products in Germany; the "Volksempfänger" radio receiver for instance. On May 28, 1937, Gesellschaft zur Vorbereitung des Deutschen Volkswagens mbH ("Company for the Preparation of the German Volkswagen Ltd."), or Gezuvor for short, was established by the Deutsche Arbeitsfront in Berlin. More than a year later, on September 16, 1938, it was renamed to Volkswagenwerk GmbH. One of the factory's War-time 'KdF-Wagen' cars had been taken to the factory for repairs and abandoned there. Hirst had it repainted green and demonstrated it to British Army headquarters. Short of light transport, in September 1945 the British Army was persuaded to place a vital order for 20,000 cars. However, production facilities had been massively disrupted, there was a refugee crisis at and around the factory and some parts (such as carburetors) were unavailable. With striking humanity and great engineering and management ingenuity, Hirst and his German assistant Heinrich Nordhoff (who went on to run the Wolfsburg facility after Military Government ended in 1949) helped to stabilize the acute social situation while simultaneously re-establishing production. Hirst, for example, used his fine engineering experience to arrange the manufacture of carburetors, the original producers being effectively 'lost' in the Russian zone. The first few hundred cars went to personnel from the occupying forces, and to the German Post Office. Some British Service personnel were allowed to take their Beetles back to the United Kingdom when they were demobilised. Canadian Motors, Limited brought in Canada's first shipment of Volkswagens on 10 July 1952 (shipping order 143075). The order consisted of 12 vehicles, (3) model 11C, a black, green, and sandcolor (3) 11GS, a chestnut brown and two azure blue, (2) 24A-M51 in red, (1)21A in blue, (1) 23A in blue, (1) 22A beige color, and one ambulance. Volkswagens were seen in Canada for the first time at the Canadian National Exhibition in August 1952 and were accepted enthusiastically. (At least one Type 2 bus from this order still exists, and is currently in France undergoing restoration). The first shipment for Volkswagen Canada reached Toronto in early December 1952. (At least one Type 1 from this first shipment still exists, and was driven on a nationwide tour for Volkswagen Canada's 60th year of business festivities in 2012). By 1955, sales were on a basis that warranted the building of the Volkswagen plant on a 32-acre (130,000 m2) site on Scarboro's Golden Mile. To this, a 60,000-square-foot (5,600 m2) building with administration, showrooms, service, repairs and parts was built in 1957, with storage for $4,000,000 of parts. On August 22, 1960, Volkswagenwerk GmbH was renamed to Volkswagenwerk AG. Volkswagen added a "Super Beetle" (the Type 131) to its lineup in 1971. The Type 131 differed from the standard Beetle in its use of a MacPherson strut front suspension instead of the usual torsion bars. The Super Beetle featured a new hooded, padded dash and curved windshield (from 1973 model year on up). Rack and pinion steering replaced recirculating ball steering gears in model year 1974 and up. The front of the car was stretched 2 inches (51 mm) to allow the spare tire to lie flat, and the combination of these two features increased the usable front luggage space. While Volkswagen's range of cars soon became similar to that of other large European automakers, the Golf has been the mainstay of the Volkswagen lineup since its introduction, and the mechanical basis for several other cars of the company. There have been seven generations of the Volkswagen Golf, the first of which was produced from the summer of 1974 until the autumn of 1983 (sold as the Rabbit in the United States and Canada and as the Caribe in Latin America). 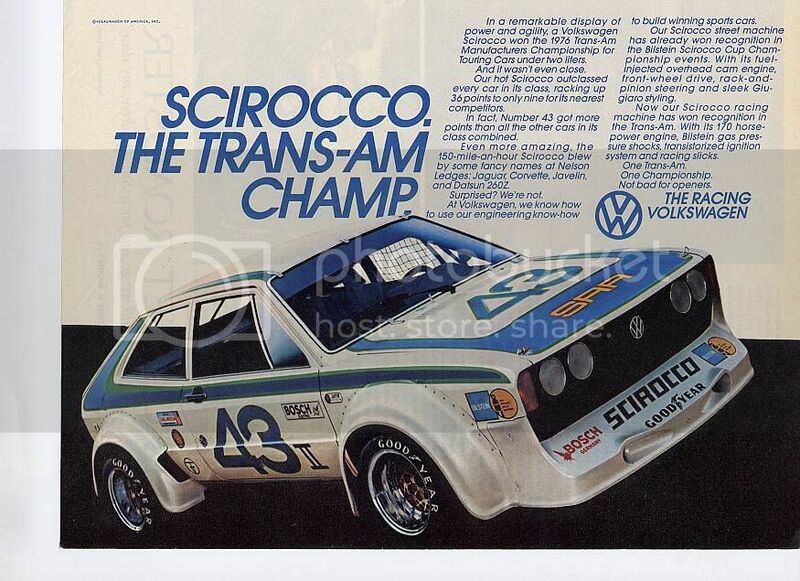 Its chassis also spawned the Volkswagen Scirocco sport coupe, Volkswagen Jetta saloon/sedan, Volkswagen Golf Cabriolet convertible, and Volkswagen Caddy pick-up. North American production of the Rabbit commenced at the Volkswagen Westmoreland Assembly Plant near New Stanton, Pennsylvania in 1978. It would be produced in the United States as the Rabbit until the spring of 1984. The second-generation Golf hatchback/Jetta sedan ran from October 1983 until the autumn of 1991, and a North American version produced at Westmoreland Assembly went on sale at the start of the 1985 model year. The production numbers of the first-generation Golf has continued to grow annually in South Africa as the Citi Golf, with only minor modifications to the interior, engine and chassis, using tooling relocated from the New Stanton, Pennsylvania plant when that site began to build the Second Generation car. In the 1980s, Volkswagen's sales in the United States and Canada fell dramatically, despite the success of models like the Golf elsewhere. The Japanese and the Americans were able to compete with similar products at lower prices. Sales in the United States were 293,595 in 1980, but by 1984 they were down to 177,709. The introduction of the second-generation Golf, GTI and Jetta models helped Volkswagen briefly in North America. Motor Trend named the GTI its Car of the Year for 1985, and Volkswagen rose in the J.D. Power buyer satisfaction ratings to eighth place in 1985, up from 22nd a year earlier. VW's American sales broke 200,000 in 1985 and 1986 before resuming the downward trend from earlier in the decade. Chairman Carl Hahn decided to expand the company elsewhere (mostly in developing countries), and the New Stanton, Pennsylvania factory closed on 14 July 1988. Meanwhile, four years after signing a cooperation agreement with the Spanish car maker SEAT in 1982, Hahn expanded the company by purchasing a majority share of SEAT up to 75% by the end of 1986, which VW bought outright in 1990. On July 4, 1985, Volkswagenwerk AG was renamed to Volkswagen AG. Volkswagen in 2005 maintained North American sales of 224,195. Momentum continued for fiscal 2006, as VW's North American sales for the year were 235,140 vehicles, a 4.9 percent increase over 2005, despite a slump in domestic North American manufacturer's sales. In conjunction with the introduction of new models, production location of Volkswagen vehicles also underwent great change. The 2007 Eos, a hardtop convertible, is produced in a new facility in Portugal. All Golfs/Rabbits and GTIs as of 2006 are manufactured in Wolfsburg, Germany, rather than VW's Mexican factory in Puebla, where Golfs and GTIs for the North American market were produced from 1989 to 1998, and the Brazilian factory in Curitiba, where Golfs and GTIs were produced from 1999 to 2006 (the Jetta has primarily been made in Mexico since 1989). VW is also in the process of reconfiguring an automotive assembly plant in Belgium. The new models and investments in manufacturing improvements were noticed immediately by automotive critics. Favorable reviews for VW's newest cars include the GTI being named by Consumer Reports as the top sporty car under $25,000, one of Car and Driver magazine's "10 Best" for 2007, Automobile Magazine's 2007 Car of the Year, as well as a 2008 Motor Trend comparison ranking the mid-size Passat first in its class. Volkswagen partnered with Daimler AG and other companies to market the BlueTec clean diesel technology on cars and trucks from Mercedes-Benz, Volkswagen, and other companies and brands. According to the United States Environmental Protection Agency, four of the ten most fuel-efficient vehicles available for sale in the U.S. are powered by Volkswagen diesel engines. Volkswagen has offered a number of its vehicles with a TDI (Turbocharged Direct Injection) engine, which lends class-leading fuel economy to several models. They were a three-way tie for 8th (TDI Beetle, TDI Golf, TDI Jetta) and ninth, the TDI Jetta Wagon. In addition, all Volkswagen TDI diesel engines produced from 1996 to 2006 can be driven on 100% biodiesel fuel. For the 2007 model year, however, strict U.S. government emissions regulations have forced VW to drop most diesels from their U.S. engine lineup, but a new lineup of diesel engines compatible to U.S. standards returned to the American market starting with Model Year 2009. These post-2009 Clean Diesel engines are limited to running on 5% (B5) biodiesel only to maintain Volkswagen's warranty. Volkswagen long resisted adding a SUV to its lineup, but relented with the introduction of the Touareg, made in partnership with Porsche, while they worked on the Porsche Cayenne and later the Audi Q7. Though acclaimed as a fine handling vehicle, the Touareg has been a modest seller at best, and it has been criticised by auto reviewers for its absence of a third-row seat, the relatively poor fuel economy, and the high vehicle mass. VW set plans to add a compact SUV with styling influences from the "Concept A" concept vehicle introduced at the 2006 Geneva Auto Show, and on 20 July 2006, VW announced that the new vehicle, called the Tiguan. The Volkswagen Atlas (a large crossover SUV) begins production in late 2016, and aims to help end several years of losses for Volkswagen in the US, the world's second-largest auto market. Volkswagen is the founding and namesake member of the Volkswagen Group, a large international corporation in charge of multiple car and truck brands, including Audi, SEAT, Lamborghini, Bentley, Bugatti, Scania, MAN, and Škoda. Volkswagen Group's global headquarters are located in Volkswagen's historic home of Wolfsburg, Germany. In 2010, Volkswagen posted record sales of 6.29 million vehicles, with its global market share at 11.4%. In 2008, Volkswagen became the third largest automaker in the world, and, as of 2012, Volkswagen is the second largest manufacturer worldwide. Volkswagen has aimed to double its US market share from 2% to 4% in 2014, and is aiming to become, sustainably, the world's largest car maker by 2018. Volkswagen Group's core markets include Germany and China. Volkswagen has factories in many parts of the world, manufacturing or assembling vehicles for local markets. In addition to plants in Germany, Volkswagen has manufacturing or assembly facilities in Mexico, the US, Slovakia, China, India, Indonesia, Russia, Malaysia, Brazil, Argentina, Portugal, Spain, Poland, the Czech Republic, Bosnia and Herzegovina, and South Africa. In 2011, Volkswagen was named in the top 25 largest companies in the world by the Forbes Global 2000. On 4 March 2005, the European Commission brought an action against the Federal Republic of Germany before the European Court of Justice, claiming that the Volkswagen Law, which prevents any shareholder in Volkswagen from executing more than 20% of the total voting rights in the firm, was illegally restricting the flow of capital in Europe. On 13 February 2007, Advocate General Dámaso Ruiz-Jarabo Colomer submitted an opinion to the court in support of the action. This again opened the possibility of a hostile takeover of VW and so on 26 March of the same year Porsche took its holding of Volkswagen shares to 30.9%. Porsche formally announced in a press statement that it did not intend to take over Volkswagen, but intended the move to avoid a competitor's taking a large stake and to stop hedge funds from dismantling VW. As expected, on 22 October 2007, the European Court of Justice ruled in agreement with Ruiz-Jarabo and the law was struck down. In October 2007, the European Court of Justice ruled that the VW law was illegal because it was protectionist. At that time, Porsche held 31% of VW shares — although a smaller proportion of voting rights, due to the Volkswagen Law — and there had been speculation that Porsche would be interested in taking over VW if the law did not stand in its way. The court also prevented the government from appointing Volkswagen board members. The German government then rewrote the Volkswagen law, only to be sued again. In October 2013, the EU Court of Justice in Luxembourg ruled that the rewritten Volkswagen law "complied in full" with EU rules. Volkswagen do Brasil produced and sold neat ethanol-powered, (E100 only), vehicles in Brazil, and production was discontinued only after they were supplanted by more modern Flex Fuel technology. As a response to the 1973 oil crisis, the Brazilian government began promoting bioethanol as a fuel, and the National Alcohol Program -Pró-Álcool- (Portuguese: Programa Nacional do Álcool) was launched in 1975. Compelled by the 1979 energy crisis, and after development and testing with government fleets by the CTA at São José dos Campos, and further testing of several prototypes developed by the four local carmakers, including Volkswagen do Brasil, neat ethanol vehicles were launched in the Brazilian market. Gasoline engines were modified to support hydrous ethanol characteristics and changes included compression ratio, amount of fuel injected, replacement of materials that would get corroded by the contact with ethanol, use of colder spark plugs suitable for dissipating heat due to higher flame temperatures, and an auxiliary cold-start system that injects gasoline from a small tank in the engine compartment to help starting when cold. Within six years, around 75% of all Brazilian passenger cars were manufactured with ethanol engines. In order to comply with increasingly strict carbon dioxide emission limits in major markets, the VW Group expects to sell about one million all-electric and plug-in hybrid vehicles a year worldwide by 2025. The Group plans to expand its plug-in range with 20 new pure electric and plug-in hybrid cars, including two cars to compete with Tesla Motors, the Porsche Mission E all-electric car and the Audi e-tron quattro, which is expected to become the brand's first mass production electric vehicle. According to Thomas Ulbrich, VW brand production chief, the carmaker has capacitty to build as many as 75,000 battery electric and plug-in hybrids a year if demand rises. Volkswagen announced in October 2015 that "it will develop a modular architecture for battery electric cars, called the MEB. The standardized system will be designed for all body structures and vehicle types and will allow the company to build emotionally appealing EVs with a range of up to 310 mi (500 km)." In June 2016, VW launched a program to develop 30 all-electric cars in 10 years, and sell 2-3 million electric cars per year by 2025. Due to lower manpower requirements for electric motors than for piston engines, VW expects a gradual workforce reduction as numbers of electric cars increase. VW considers battery factory ownership as too expensive. Volkswagen first implemented its seven environmental goals in Technical Development in 1996. The plan contains themes involving climate protection, resource conservation, and healthcare, through objectives such as reducing greenhouse emissions and fuel consumption, enabling the use of alternative fuels, and avoiding the use of hazardous materials. The original 1996 goals have since been revised in 2002 and 2007. Volkswagen was the first car manufacturer to apply ISO 14000, during its drafting stage and was re-certified under the standards in September 2005. In 2011 Greenpeace began criticising Volkswagen's opposition to legislation requiring tighter controls on CO2 emissions and energy efficiency, and an advertising campaign was launched parodying VW's recent series of Star Wars-based commercials. As of 2014[update], VW is registered with a Corporate Average Fuel Economy (CAFE) of 34-38 mpg in USA. On Friday, 18 September 2015, the United States Environmental Protection Agency (EPA) said beginning in 2008 the automaker improperly installed engine control unit (ECU) software determined to be a "defeat device", in violation of the Clean Air Act to circumvent environmental regulations of NOx emissions by diesel engine 2009-2015 model year Volkswagen and Audi cars. The software detects when the cars were being subject to emissions testing, and then fully enabled ECU emission controls to successfully pass. However, during normal driving conditions, emission control software was shut off in order to attain greater fuel economy and additional power, resulting in as much as 40 times more pollution than allowed by law. Consumer Reports tested a 2011 Jetta SportWagen TDI and found in emissions mode its 0-60 mph time increased by 0.6 seconds and its highway fuel economy dropped from 50 mpg to 46 mpg. Volkswagen admitted to using the defeat device, and has been ordered to recall approximately 482,000 cars with four-cylinder 2.0-liter TDI engines. United States federal penalties may include fines ranging up to US$18 billion, and possibly criminal charges. On June 28, 2016, Volkswagen agreed to pay a settlement of $15.3 billion, the largest auto-related consumer class-action lawsuit in the United States history. On the first business day after the news, Volkswagen's stock price declined 20% and declined another 17% on Tuesday, that same day a social media advertisement with Wired about "how diesel was re-engineered" was removed as well as a series of YouTube ads titled "Diesel Old Wives’ Tales". On Wednesday, 23 September, Volkswagen chief executive officer Martin Winterkorn resigned. Volkswagen hired Kirkland & Ellis law firm for defense, the same firm that defended BP during the Deepwater Horizon oil spill. On November 2, the EPA issued a second notice of violation (NOV) pertaining to certain diesel 3.0-liter V6 equipped Audi, Volkswagen Touareg and Porsche Cayenne vehicles. The EPA found beginning with the 2009 model year all vehicles powered by the V6 were non-compliant. During testing the EPA, CARB and Transport Canada discovered software that activates pollution reduction systems when the automobiles are being driven under federal test conditions, otherwise during real world driving these devices are inactive. Volkswagen disputed the EPA's findings stating their software is legally permitted, however shortly after Volkswagen issued a stop-sale for the EPA's disputed vehicles and additional models the EPA did not question. In November 2016, Volkswagen and its labour unions agreed to reduce the workforce by 30,000 people until 2021 as a result of the costs from the violations. However, 9,000 new jobs would come by producing more electric cars. Volkswagen also announced plans to become the world leader in electric cars, producing 1 million VW-EVs by 2025 and 3 million by the group, and a VW manager stated that its diesel cars would not become available in USA. On Wednesday, 11 January 2017, Volkswagen agreed to plead guilty to the emissions-cheating scandal and to pay $4.3 billion in penalties. Six Volkswagen executives were charged. The following day, one of the indicted executives was ordered to be held without bail pending trial as it was feared that he would flee to Germany and extradition would be impossible. For this reason, senior VW management staff were warned not to travel to the US. On 23 January 2017, a US judge approved a $1.2 billion settlement in which 650 American dealers, "who, like consumers, were blindsided by the brazen fraud that VW perpetrated," would receive an average of $1.85 million. In March 2016 the US Federal Trade Commission sued Volkswagen for false advertising, having found that Volkswagen's "clean diesel" vehicles were less environmentally friendly than advertised. In July 2011 Wolfgang Dürheimer, the director of Bugatti and Bentley, told German magazine Auto, Motor und Sport that "if [the VW group] is at the forefront of the auto industry, I can imagine us competing in Formula 1 in 2018. We have enough brands to pull it off." Despite the ongoing emissions scandal, VW's production for the first six months' of 2016 has been confirmed at 5,268,000 cars. Toyota produced 5,033,177 cars, while GM's total figure has yet to be released, but is known to be smaller. ↑ Tooze notes: "Even if the war had not intervened, developments up to 1939 made clear that the entire conception of the 'people's car' was a disastrous flop." Tooze (2006) p.156). ↑ 13.0 13.1 13.2 Odin, L.C. World in Motion 1939 - The whole of the year's automobile production. Belvedere Publishing, 2015. ASIN: B00ZLN91ZG. ↑ Anders Ditlev Clausager (18 March 2000). Obituaries – Ivan Hirst The Guardian(UK). ↑ Colin Shinkin About the 1972 Baja Champion SE – USA (photos). SEBeetles.com. ↑ William Beaver (Nov–Dec 1992). Volkswagen's American assembly plant: Fahrvergnugen was not enough – international marketing findarticles.com; Business Horizons. ↑ By Charlie Osborne, ZDNet. “Volkswagen launches new cybersecurity firm to tackle car security.” September 15, 2016. Retrieved September 15, 2016. ↑ "Tabela 08 – Vendas Atacado Mercado Interno por Tipo e Empresa – Combustível Flex Fuel – 2005" (PDF) (in Portuguese). ANFAVEA – Associação Nacional dos Fabricantes de Veículos Automotores (Brazil). Retrieved 16 April 2009. CS1 maint: Unrecognized language (link) <templatestyles src="Module:Citation/CS1/styles.css"></templatestyles> See Table 08 for flex-fuel sales and Table 07 for gasoline sales. ↑ "Tabela 08 – Vendas Atacado Mercado Interno por Tipo e Empresa – Combustível Flex Fuel – 2007" (PDF) (in Portuguese). ANFAVEA – Associação Nacional dos Fabricantes de Veículos Automotores (Brazil). Retrieved 16 April 2009. CS1 maint: Unrecognized language (link) <templatestyles src="Module:Citation/CS1/styles.css"></templatestyles> See Table 08 for flex-fuel sales and Table 07 for gasoline sales. ↑ "Tabela 08 – Vendas Atacado Mercado Interno por Tipo e Empresa – Combustível Flex Fuel – 2008" (PDF) (in Portuguese). ANFAVEA – Associação Nacional dos Fabricantes de Veículos Automotores (Brazil). Retrieved 16 April 2009. CS1 maint: Unrecognized language (link) <templatestyles src="Module:Citation/CS1/styles.css"></templatestyles> See Table 08. ↑ DAVID McHUGH. "VW Betting on New Technology" Associated Press, 22 November 2016. This page was last modified on 5 May 2017, at 04:40.